To mark America Recycles Day, Great Forest has created a handy chart that follows the flow of your office waste, with reminders of what to do and what NOT to do. 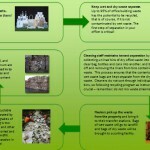 This entry was posted in How To Guides and tagged chart, recycling. Bookmark the permalink. Q&A: As a building manager at a commercial office building, what do I need to know about disposing hazardous waste? This entry was posted in Q&A and tagged universal waste. Bookmark the permalink.